We are investigating whether epigenetic marks, such as DNA methylation early in life, relate to intrauterine growth, placental calcium transport and postnatal skeletal development. Working with collaborators at the Institute of Developmental Sciences, University of Southampton, the University of Bristol, and King’s College London, we are exploring epigenetic signals in relation to skeletal development across the lifecourse. We have a well-established discovery pipeline from genome wide to candidate and functional validation, using observational cohorts such as Southampton Women’s Survey in early life, and Hertfordshire Cohort in older age, together with unique opportunities to test identified targets in the context of randomised controlled trials such as MAVIDOS. 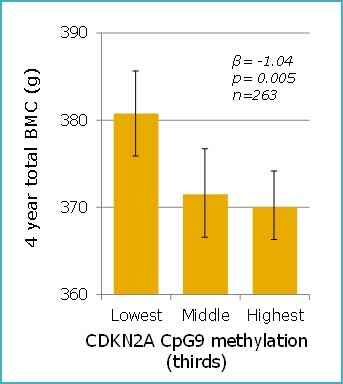 In addition to increased mechanistic understanding, these studies have the potential to identify epigenetic signals that may be used as early biomarkers of later adverse bone health, enabling the targeting of lifestyle interventions (for example maternal vitamin D or PUFA supplementation) to individuals at the greatest risk of future fracture.